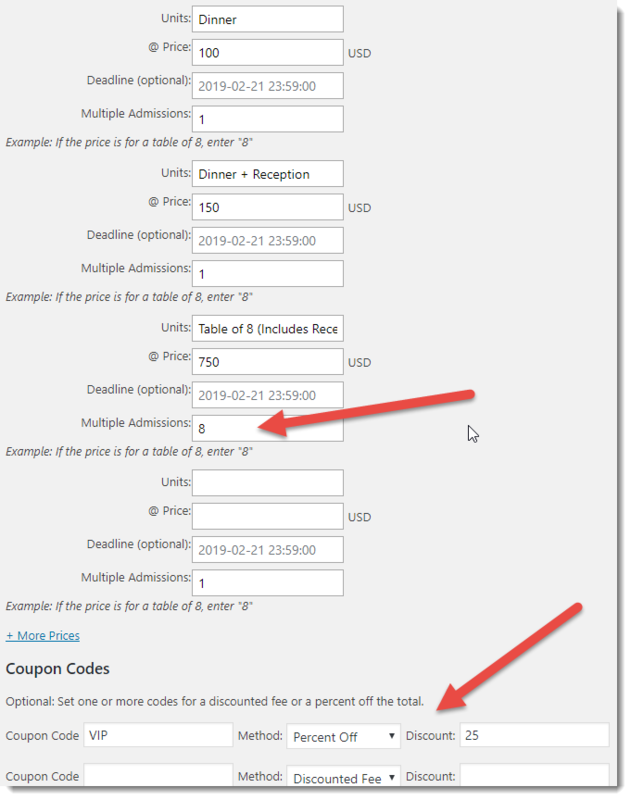 In response to a user request (underwritten with a donation to the cause), RSVPMaker now allows you to establish coupon codes for discount pricing for an event. 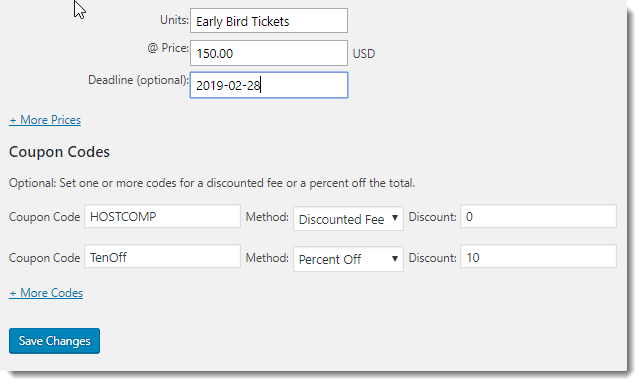 Specific pricing, such as an “Early Bird” registration offer can also have an expiration date (that’s not new). 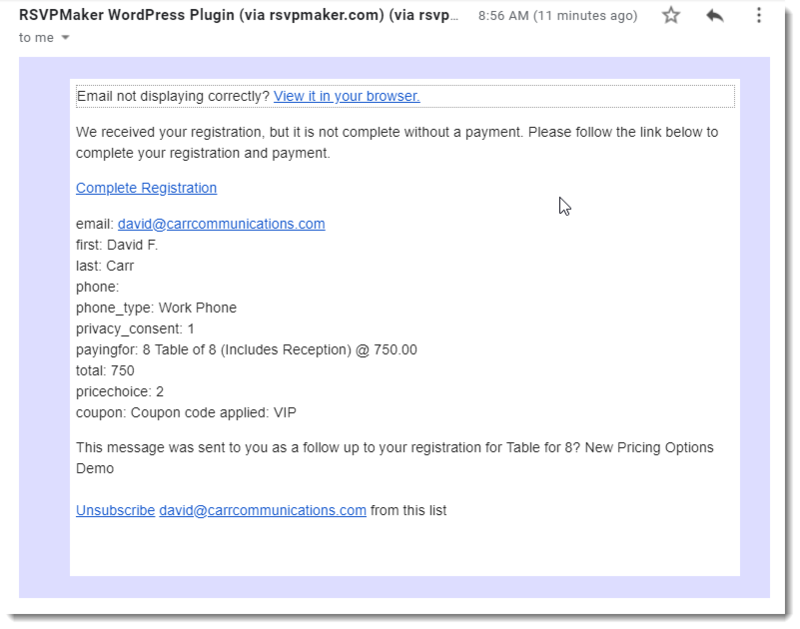 Another feature, probably long overdue, is that you can have RSVPMaker send a “Payment Required” reminder when someone registers for your event but doesn’t pay. In e-commerce terms, this is essentially an “abandoned shopping cart” problem that needs solving if you want people to pay for an event in advance and do not want them showing up thinking they are registered when they failed to complete the registration with a payment. This is still optional. Some groups I’ve worked with, such as professional networking organization, want people to register in advance but are fine with taking a check at the door. They offer online payment as an option, not a requirement. On the other hand, if you’re registering people for an online class, you know you have to get that payment online (no “at the door” for you). 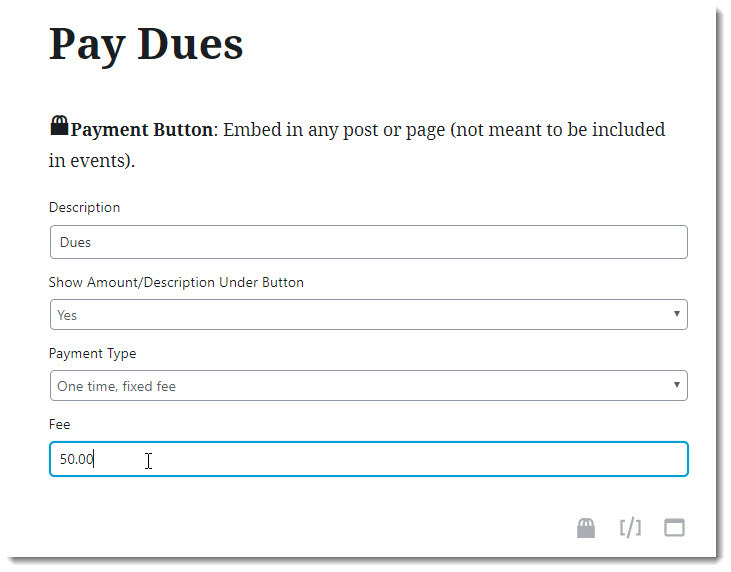 To turn on payment reminders, go to the RSVPMaker settings screen, Payments tab. If you want to change the notification headline or body copy from the defaults, you can do that from the Notification Templates screen under RSVP Mailer. I provide codes for including elements such as the email subject line, which are documented at the bottom of that screen. This is also where you can customize the notification sent to the event owner and the confirmation message sent to the person registering for an event. The Limited Time Content wrapper block for Gutenberg has also been updated to allow the option of setting expired content to be automatically deleted. This is a container into which you can place paragraphs, images, and other content (InnerBlocks in Gutenberg terminology). You can then set a start time, an end time, or both. The Limited Time Content block contents will be hidden if the current time is before the start time or after the end time. 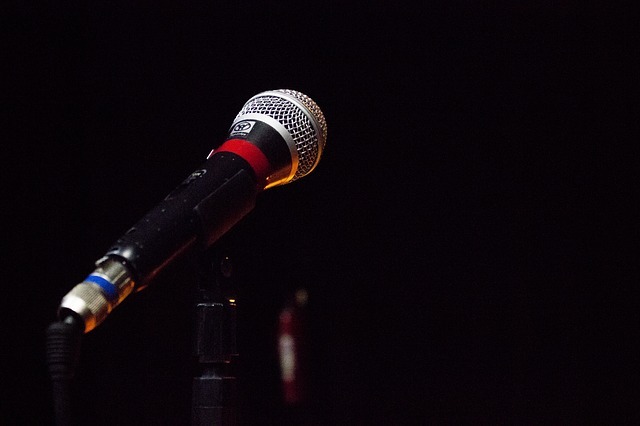 The idea is to allow you to display an event promotion — or any other content that only makes sense to display for a limited time, such as a limited-time price for goods or services — without worrying that it will still be showing up weeks later because you forgot to take it down. By default, you will have to go back into the editor and remove expired content after the end date/time has passed. However, as of release 5.8.5, you can have RSVPMaker automatically delete that block of expired content. Note: It took me several tries to find a regular expression search and replace pattern that would delete the target block and leave all other content alone. If you’re not inclined to trust the software to do this for you, you can stick with the manual method. If you use the automated method, you may want to make sure you have WordPress configured to track revisions so you can retrieve the deleted content if necessary. Coaches, please register using the RSVP form and add the names of each athlete as part of your registration. You can make this change on the Event Options page linked to each RSVPMaker post. RSVPMaker is ready for WordPress 5.0. 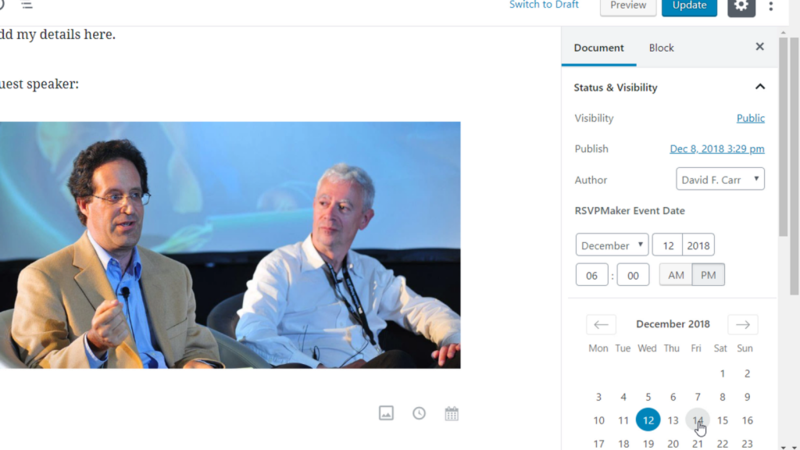 That doesn’t mean there is not still considerable room for improvement in how it integrates with the new Gutenberg editing experience, but the main thing you need to know is where to find options that have moved. 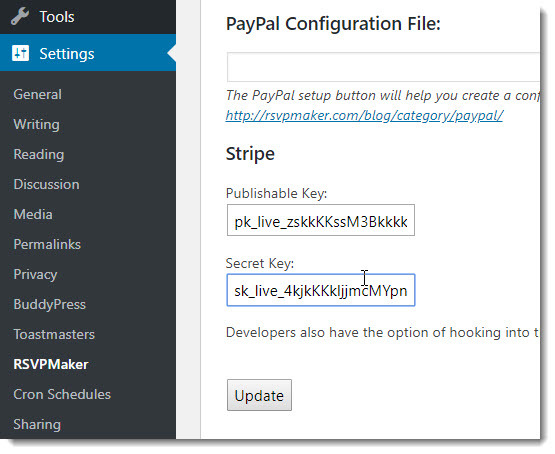 RSVPMaker demo in the new WordPress 5.0 editor. One of the goals of the new editor is to “declutter” the editing screen so that blog authors, in particular, can focus on writing without being distracted. 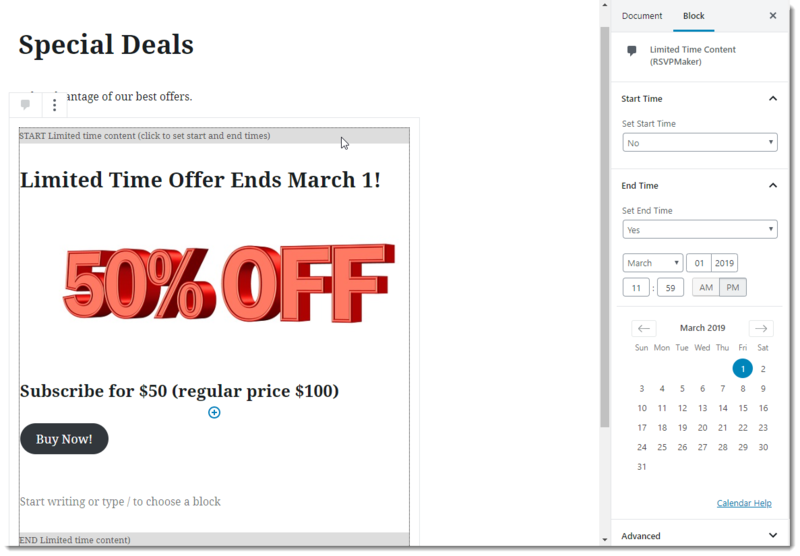 Plugin authors are discouraged from using the old “meta box” model where lots of options where displayed beneath the main content editing area. 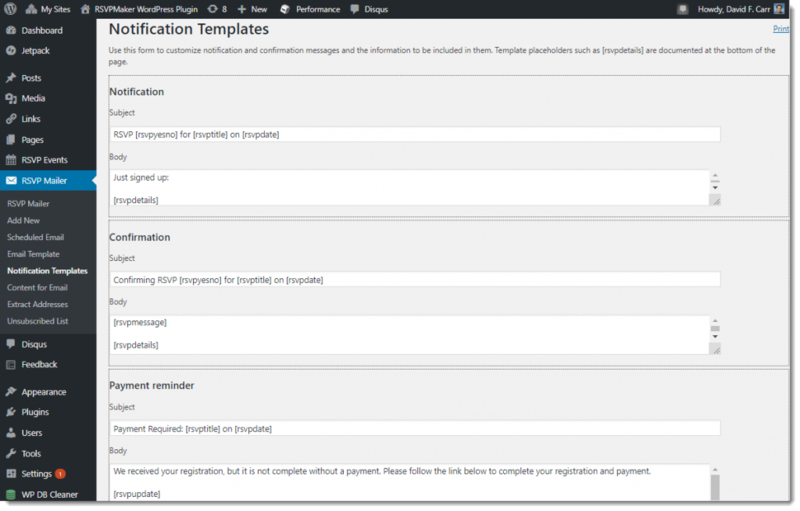 For that reason, many of the more elaborate RSVPMaker options for setting confirmation messages, registration options, and prices have moved to a separate screen. When you click Add New for an RSVPMaker event, instead of going straight to the editor, you will see this screen asking you to set the event date and a few other basic options up front. 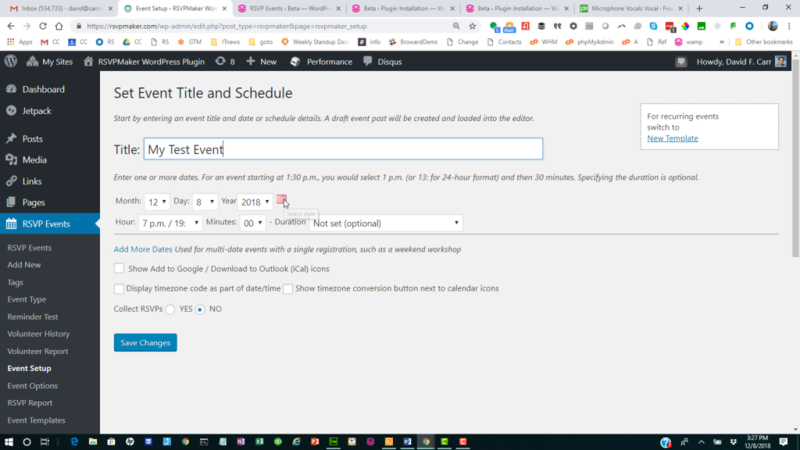 Note that there is also a link in the upper right hand corner that lets you shift from adding a single event to adding a template for a schedule of recurring events. An RSVPMaker event post, with the calendar widget showing. Within the editor, you will see a calendar widget in the documents tab of the sidebar that allows you to change the event date and time. This is a little tricky because that calendar can be hidden when you are editing blocks of content. Click on the Documents tab in the sidebar, and you’ll find it under Status and Visibility. Don’t confuse the event date with the Publish date. If you set the Publish date to a future date, the post will not appear on your website until that date. To set other event parameters, including some like event pricing that aren’t shown on the Add New screen, click the RSVP / Event Options link that appears on the black menu bar when you are logged in and have event editing rights. 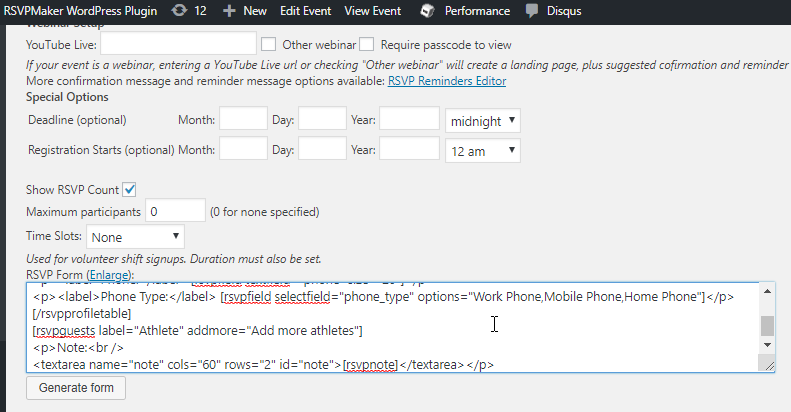 You will see that when either viewing or editing an RSVPMaker event post. You can navigate back and forth between the event options screen and the editor for event content. “Create / Update” option appears on the black administration menu. Click there to add a batch of events based on the template to your site or update previously added events based on your changes to the template. 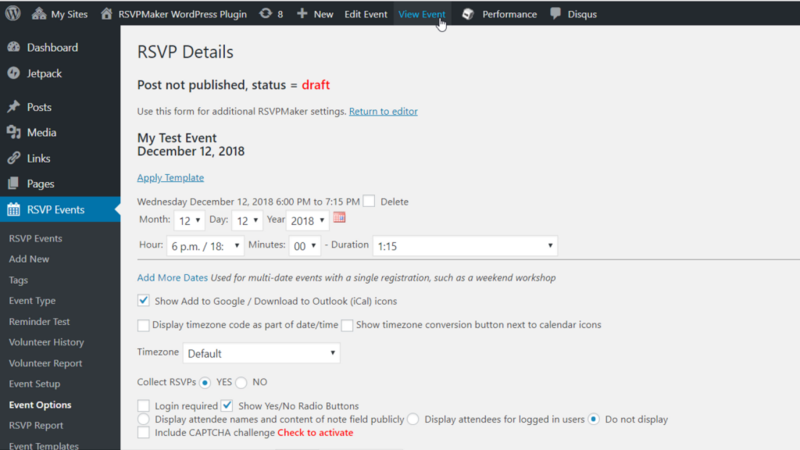 In addition, RSVPMaker now offers 2 Gutenberg blocks: RSVPMaker Upcoming for adding an events listing and/or calendar and RSVPMaker Embed Event for embedding a single event in a page or post. These are the successors to the shortcodes used in earlier releases (the shortcodes should still work). Watch the video embedded above for a tour of the updated RSVPMaker editing experience.